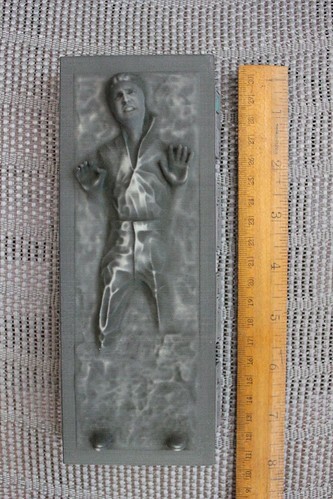 Six weeks after being sentences to intergalactic imprisonment at Star Wars Weekends, a “carbonite” figure with my likeness has been delivered by Walt Disney World with most impressive results. 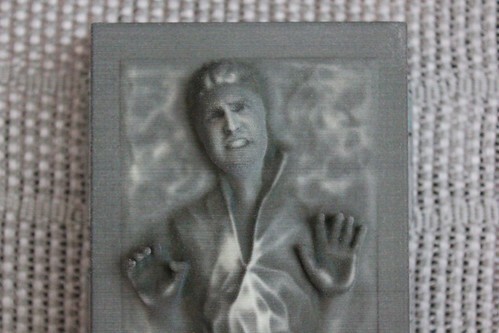 Featuring my grimacing face replacing the iconic visage of Han Solo (Harrison Ford) as seen in “Star Wars Episode V: The Empire Strikes Back,” this 3D-printed figure created as part of Disney’s “Carbon Freeze Me” experience doesn’t disappoint as a custom collectible. Though the figure took a couple weeks longer to arrive than the given timeframe (3-4 weeks), Disney made good on all other promises, particularly in producing a high-quality and quite unique piece of merchandise that’s now exclusive to my own “Star Wars” collection. 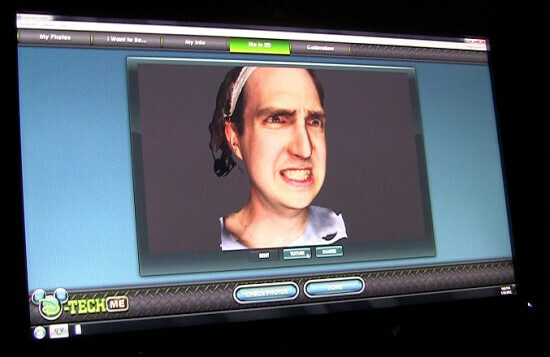 Not only was the experience itself a fun process, but after six weeks of anxiously awaiting delivery, I am excited about the results as the figure contains a perfect likeness of my face, exactly as scanned at Disney’s Hollywood Studios. Take a closer look in the video and photos below. 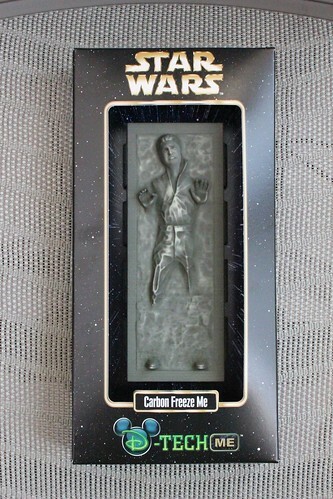 Including tax and shipping, the Carbon Freeze Me figure cost me $122.40. It was shipped from Walt Disney World, just 15 minutes from my house in the Orlando area, but no local pickup option was available. The added cost for shipping came as a shock to some guests during checkout but now that the figure has arrived, I can see the need for care. It’s not like a typical item seen on Disney’s store shelves, often made of rather solid plastic or resin. 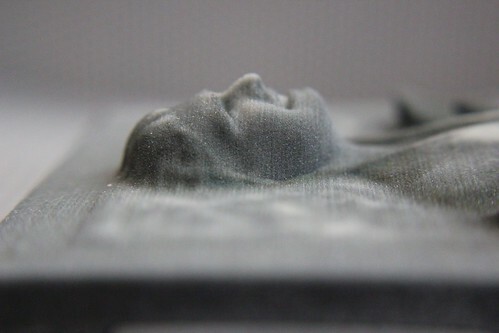 This figure was created using a 3D printer and feels quite fragile. 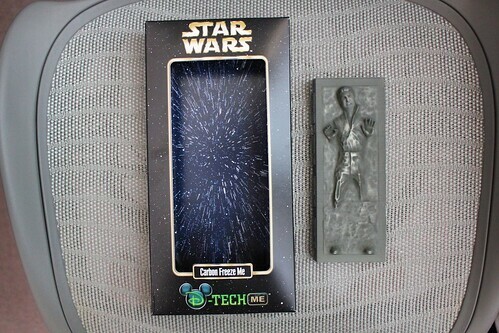 The Carbon Freeze Me figure arrived to my house yesterday in a “Star Wars”-branded box, also sporting Disney’s D-Tech Me logo. 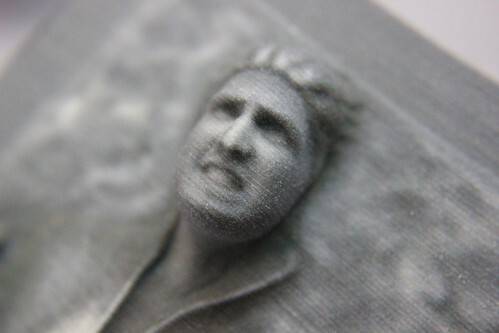 It looks like any other piece of “Star Wars” merchandise one might find in a store, except this one features my face – and an incredibly accurate recreation of my face at that. It’s quite shocking to see such small detail in the figure, down to the shape of my eyebrows and the curvature of my cheek bones and jaw line. And the look in my eyes and grit of my teeth are spot on with the expression I made for just a second or two when posing at Disney’s Hollywood Studios a few weeks ago. 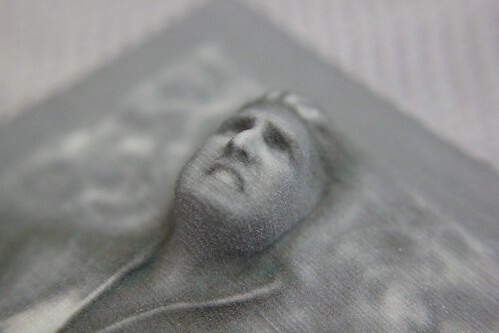 Removing the 7.5″ tall figurine from the package, I instantly notice its gritty texture, with small white grains flaking off in my hands, a by-product of the 3D printing process used to create it. 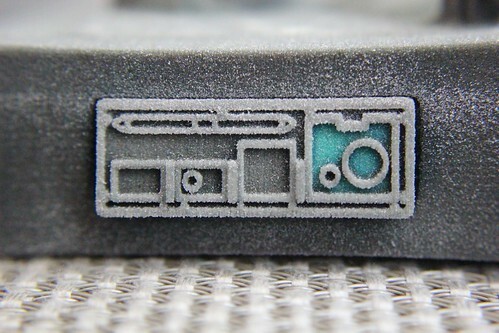 More tell-tale signs of the 3D printing process are faint horizontal lines, a millimeter tall or less, visible throughout the piece. The figure was created “line by line” from top to bottom, leaving subtle traces of the process behind. But those details are only visible upon extremely close inspection. Disney hasn’t said whether they plan to offer Carbon Freeze Me again, but if they do (perhaps at Star Wars Celebration VI? ), I would recommend it for adult “Star Wars” fans. 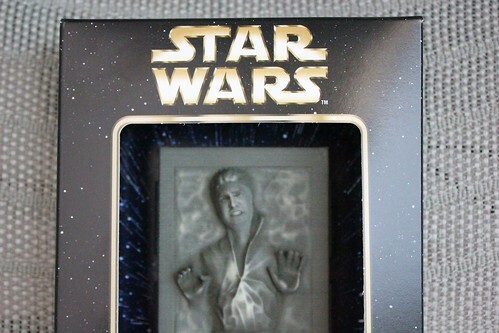 Now that I have my own custom carbonite-frozen figure in my possession, I do feel it was worth the high price tag. But it’s definitely not a toy and perhaps not the best item for kids, many of whom did take part in the experience. I could see this $100+ figure getting quickly broken when thrown into a toy bin with more durable plastic action figures. 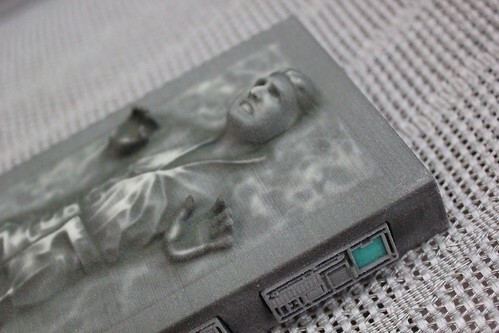 Mine will soon become a unique piece of (geeky) artwork proudly displayed among my other “Star Wars” pieces. This is so cool. Thanks for showing us the finished product. It’s definitely something to put on your wall or under glass. I can’t imagine who would be fool enough to treat it like a toy to play with. This is a collectible for saving, not a toy for playing with. Thanks for sharing these photos. My brother really wants to get this done when we are there in September (don’t worry, he’s over 40) but it sounds like he’ll be out of luck. I wish they had made it a permanent thing. I went for my appointment 7 weeks ago and I can’t even get a status update when I call Disney, just bounced around to other people who can’t help me. It was a fun experience but this is not cool. A simple status update for the orders would go a long way. Thanks for posting pictures of the finished product. I took my children for the experience during the first of the Star Wars Weekends, and we still have not received our figurines. I also lost my receipt, with the number on it regarding shipping. Do you have that phone number? Will you please forward it to me? It’s nice to see the finished product but admittedly we’re still waiting on ours to arrive. I can’t believe we haven’t received any updates on the status. 🙁 I hope it comes soon and looks as nice. I was super satisfied with the actual experience but the aftermath and lack of communication makes me doubt I’d do it again. We have received our either..I agree with Aila, the lack of communication and the difficulties of locating anyone to help track..is not really disney friendly.. Took my son on this adventure, and he loved it. I paid the high dollar shipping on this, and have not recieved the figure yet. Been waiting for over 2 months now. I lost my receipt that had the phone number to call. Does anyone else have the phone number to check on a status ??? I am somewhat upset at this point…. My son’s was done 5/26 and still haven’t received. The place to find out the status is https://tracker.d-tech.me/ If you don’t have your order #, you can click on forgot and they will send you an email with it and a link to check the status. Mine has said “cargo ready for shipment” for over 2 weeks. It also had a message, saying all would be sent out by the end of next week, but that has been on there for 1-2 weeks. When I had called a few weeks ago, they told me they had an issue with packing materials not being sturdy enough and were working on getting them out as we spoke. I don’t have the phone # anymore, I think it was the original # to call and make reservation. Denise you are awesome! Thank you for the information you provided. I was finally able to check the status of my figure. We had 2 of them done at noon on day 1 (5/18). My daughter got hers back around July 4th but my husband is still waiting for his. I called and asked to speak with a manager who assured me that everyone WILL get their product but she also refunded my money. I plan on sending a nasty-gram to Disney about this experience. Apparently the real issue had nothing to do with packaging & more to do with people getting products that had someone else’s face on them! We just got ours today (would have been 10 weeks tomorrow). They told me at the beginning of the week that all went out this week and if I didn’t get by Friday to call back (Disney merchandise). Not happy with how it arrived. The cool box that holds it was boogered up and everything was covered in (what I assume was the material) dust and when I opened the sand/powder went all over the place. The likeness is vague. I love Disney, but this was poor guest relations for sure.